The Eutech PTTestr 35 is the longest lasting tester in the market, it is capable of measuring five parameters with one sensor aswell as low, medium and high TDS ranges including pure water. The temperature sensor is housed within a unique dome shaped casing for faster ATC response and faster measurements. Simple to use features such as a scroll menu with four control buttons for stress free navigation, one press parameter toggle enabling the user to switch between parameters at the press of a button and the option to switch between ATC and MTC make this tester the ideal option to use for taking accurate measurements to a full pH range measurement at up to 2 decimal places. 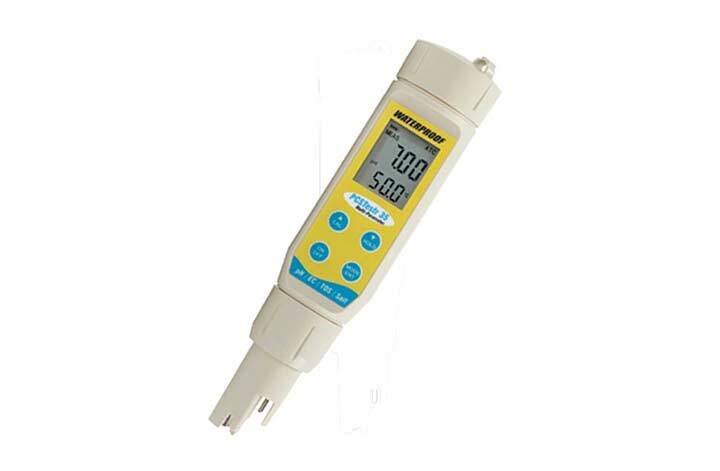 Functional features which make the PTTestr 35 the ideal choice are the 5 point pH calibration or 3 point TDS calibration, adjustable TDS factor (0.40 to 1.00) and advantage of being certified IP67 waterproof for conveinence for use in the field. This product is covered by a 2 year meter warranty.